This writing is dedicated to my Mother and Father in law who through the years has taught maybe even sometimes without knowing what a strong faith can accomplish when we stay positive and put our full trust in the Lord! The saying what doesn’t kill you makes you stronger is so true, yet our belief system is what makes the difference as we see those who have a strong faith in the Lord press on and endure many things in life while others become bitter and are most miserable. There are so many choices this life holds and if we place our faith and hope in the Lord Jesus Christ there is a huge difference for the good and we are blessed because of it! (Jeremiah 17:7-8). Blessed is the man that trusteth in the Lord, and whose hope the Lord is. For he shall be as a tree planted by the waters, and that spreadeth out her roots by the river, and shall not see when heat cometh, but her leaf shall be green; and shall not be careful in the year of drought, neither shall cease from yielding fruit. It is written the children of God are the children of the day; they are not of the night or of darkness. The faith that fills the believers heart is not set on the seen, but on the unseen and of the assurance of what is hoped for. 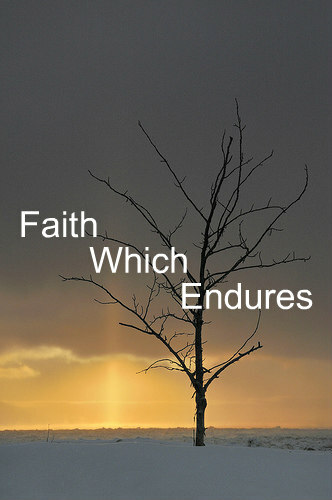 (Hebrews 11:1-3) Now faith is the substance of things hoped for, the evidence of things not seen. For by it the elders obtained a good report. Through faith we understand that the worlds were framed by the word of God, so that things which are seen were not made of things which do appear……….. (1 Thessalonians 5:1-11).